Oh man, I'm so glad it's almost Friday. I've been exhausted all week, and I can't wait to sleep in this weekend. No real plans, but that's fine with me. I must be honest...I totally misunderstood the post about the Crazy 4 Crellies Noodles Nail Polish group customs. I thought they were only available through the 8th, but apparently it was just the coupon code that was going away. Good news, you have still have a couple more weeks to get these! 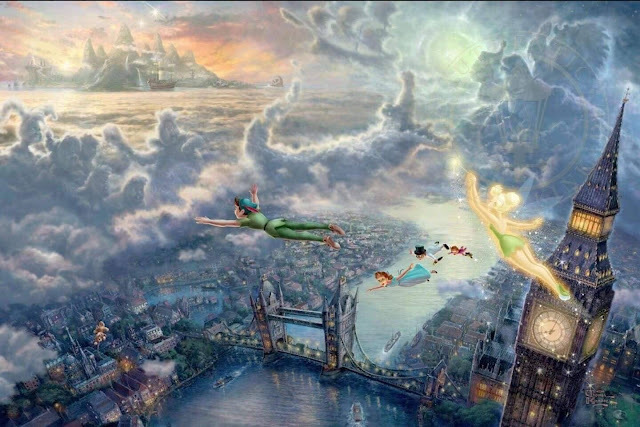 Second Star to the Right is inspired by a photo of Peter Pan and Tinkerbell in London (shown above). It's a dusty blue crelly base with lots of grey undertones. It contains violet and gold shimmer, gold and silver glitter, and purple holo glitters. All glitters are very fine, so it doesn't dry with as much texture. I used just 2 coats for my swatches, and the formula was slightly thinner than some of my other Noodles, but it wasn't problematic at all. It's a little blue, a little gold, and a little purple, so it's a winner in my book. There you have it, make sure to join the Crazy 4 Crellies and get this duo! They are only $9.50 each, and available all month through the Noodles Nail Polish website. You can find out more about Noodles Nail Polish on their website, Instagram page, Facebook page, and Facebook Fan Group.